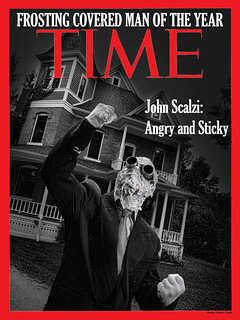 Politics! It happens in Michael J. Martinez’s new book MJ-12: Shadows! For good reason! Prepare yourself! It’s certainly easier for an individual to learn from their mistakes than, say, an entire country. Just open another browser window (after reading this) and the examples will come pouring in. Our nation is one built upon astounding successes and inhumane mistakes, and I think it’s in our character – as Americans, as human beings – to double down on success and ignore the mistakes. 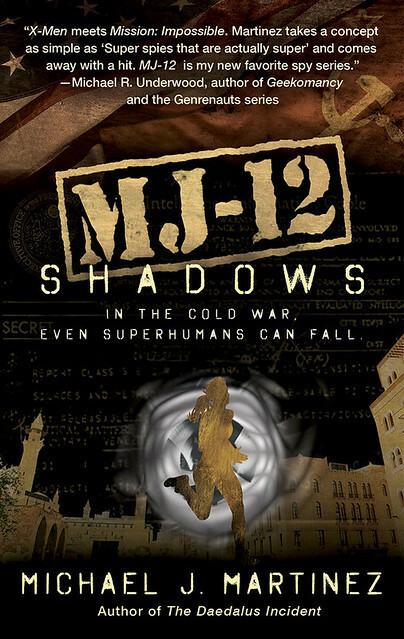 But it’s our responsibility to learn from our mistakes, and that’s a very Big Idea in the MAJESTIC-12 series, the latest of which, MJ-12: Shadows, came out this week. Both as individuals and as a nation, that responsibility takes center stage. Yeah, this gets political. Fair warning. The MAJESTIC-12 series tells the story of American covert activity during the early Cold War from the perspective of uniquely talented yet otherwise everyday Americans – individuals thrust into the center of international espionage after randomly exhibiting disturbing preternatural abilities. Basically, spies with superpowers against the Soviets. I mean, we can have fun with the weighty ideas, right? I do a goodly amount of research for my historical fantasies, and the track record of the CIA throughout the Cold War is chock full of assassinations, back alley bargains, briefcases full of money and literal dirty tricks. Some of the operations that have been declassified make Argo look perfectly reasonable and sane. Take Syria in 1949, the time and place I explore in MJ-12: Shadows. At the beginning of the year, the nation had a democratically elected government and was beginning to assert itself after centuries of Ottoman rule and decades of European colonialism afterward. But that government was not particularly inclined toward American interests – which primarily involved denying the U.S.S.R. a Mediterranean port and getting the Trans-Arabian Pipeline built through Syria. So the CIA launched an operation to replace Syria’s democratically elected government with a military strongman. It worked, and one of said strongman’s first acts was to approve the oil pipeline. By summer, the strongman was replaced by a military colleague – who was subsequently overthrown by year’s end. Three coups in a year…and the wheel goes on and on today. What would the Middle East look like today if the U.S. had supported democracy in Syria instead of working to overthrow it? Has the United States learned from these mistakes in Syria? Iran? Cuba? Vietnam? Nicaragua? Afghanistan? Iraq? Have we achieved some semblance of wisdom from our failures? Have we understood our responsibilities as a nation? I didn’t conceive of this series in our current era of God-what-now politics. I didn’t choose Syria because of what’s going on there today. Heck, I’m writing the third book of the series now, and that one is partially set in Korea. It’s scary. But I want to do all of this justice. And that means doing the research and telling a really good story – ideally, one that gets people thinking. By placing everyday people at the center of these world-shaping events – a schoolteacher, a factory worker, an electrician, a WWII veteran – I’m able to walk a mile in some fictional shoes and explore what it means to be part of it all. These characters can, and do, question why they’re there and what they’re doing, all on behalf of a government that strong-armed them to sign up in the first place because of their abilities. They have their own responsibilities and their own mistakes to make. Yes, they have superpowers. And there’s gadgets and chases and narrow escapes. I like me a good spy thriller, after all. But in the end, the real-world history is letting me tell a story about responsibility – of nations, of individuals blessed with unique gifts – and maybe explore some of the failures we’ve made, individually and collectively. Cool, I will have to check this series out! I liked your line at the end, “and maybe explore some of the failures we’ve made, individually and collectively” as that’s something that’s been on my mind more and more as I get older. 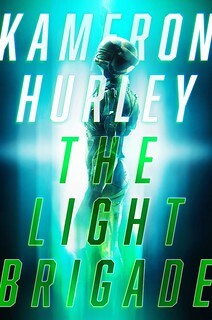 I’m currently reading the first novel in the series and I have to say it’s quite good. Martinez really develops the characters and has created an interesting Cold War story.